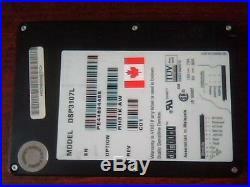 1GB 3.5 50-pin SCSI Disk Drive. DEC Digital Corp Option: RH31K-AW Rev C01. This appears to be some variant of a Quantum hard drive. Just the drive, no manual, no software, no cables. Canadian buyers must pay GST/HST so it is helpful if Canadians wait for an invoice before paying. Do not ask us to misrepresent the value of an item. The item "SCSI Hard Drive Digital DEC DSP3107L RH31K-AW Rev C01 50-pin SCSI 1GB" is in sale since Monday, August 1, 2016. This item is in the category "Computers/Tablets & Networking\Drives, Storage & Blank Media\Hard Drives (HDD, SSD & NAS)\Internal Hard Disk Drives". The seller is "wiredforservice" and is located in Ontario. This item can be shipped worldwide.